This looks interesting. I haven't read Leviathan but I may need to track down a copy! I can't wait to get stuck into this one - it looks so good! I've been meaning to get myself a copy of this for a while. It sounds rather good! What a fantastic selection! You've got loads that I would like to read too! Great books this week Sammee! Black Swan Rising and When God Was A Rabbit sound great! I am still reading the Uglies series by Scott Westerfeld, but I think I should try something different from him! Looking forward to your reviews! I'm thinking about suggesting When God was a Rabbit for the Staff Book Group. I'll be interested to see how you get on with that one. Great books this week. 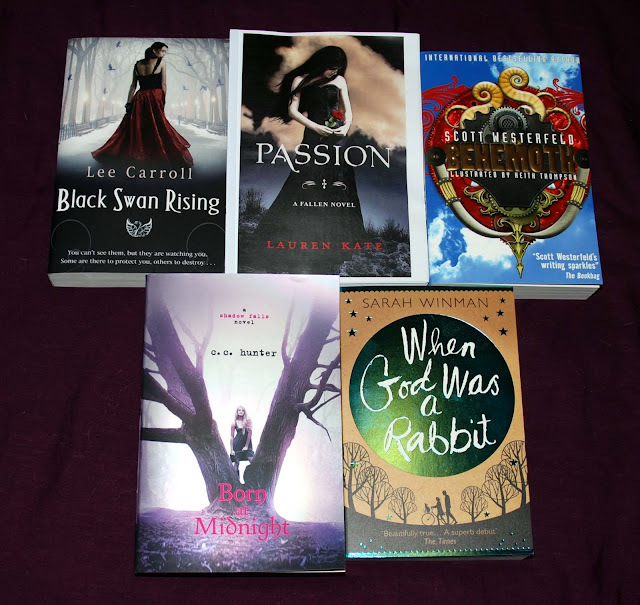 I really want to read Black Swan Rising so I'll definitely be coming back to check out your giveaway. Great, great GREAT books this week! When God Was a Rabbit is a FANTASTIC title! So intriguing! I can't wait to read "Passion." Enjoy!